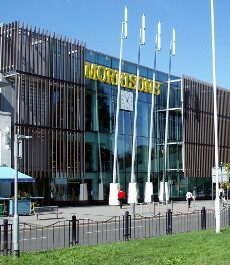 Morrison’s supermarket in Crawley town centre opened in June 2014 on the site of the old cinema, at the north end of the High Street. Two lifts and a series of four escalators, some of which are often in working order, carry customers between street level and the shop. It contains a free car park, with a maximum stay of two hours and no obligation to shop in Morrison’s. Entry to the car park is to the rear of the shop, on Pegler Way. The car park contains some particularly vicious speed bumps. N.B. Details are correct as of October 2018. There used to be a branch of Morrison’s in Broadfield, but it closed early in 2015.